Backtracking a bit on our trip up the coast we crossed near the entrance to the Long Beach Commercial Harbor. Think about managing, coordinating and not losing 6.73 MILLION 20' containers each year. 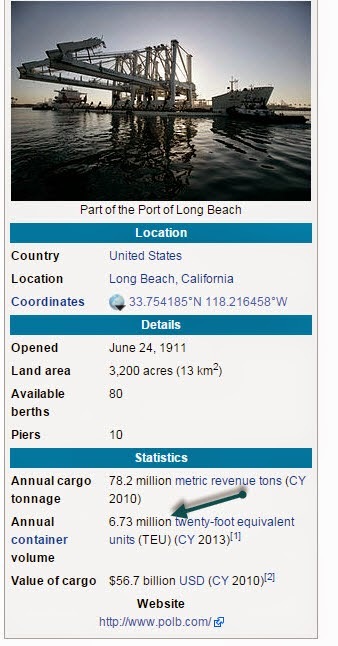 The port has been on strike for higher wages and other issues causing a back up of ship traffic. 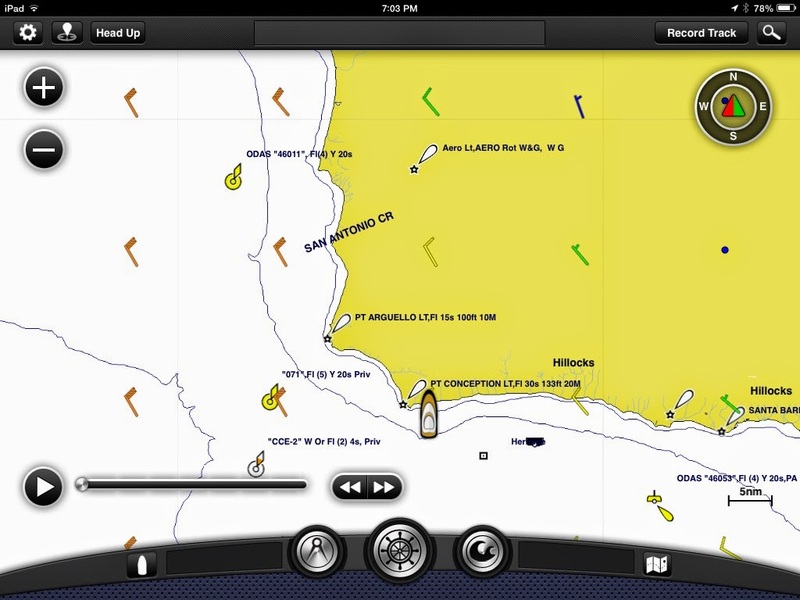 Below is a screen shot of my AIS showing dozens of ships on anchor waiting for work to resume. Each blue triangle with a name below it is a container ship. Your local Walmart may be short on stock in the next few weeks if things don't get resolved. We anchored at a Coho just east of Point Conception. There is nothing there but a few mooring balls, a remote beach and oddly good cell service. It serves as a jumping off spot to round Pt. Conception allowing us to reach Morro Bay in about 10-11 hours. This means you can round this point early in the morning and still make safe harbor in daylight. An easy run from Ventura or Santa Barbara, Coho lets you rest and then poke your head out and see just how this major headland is effecting the sea state. Between the shift in currents and the abrupt change in shoreline this area can be a wild ride. We caught a great sunset at Coho and enjoyed an early dinner and sound nights sleep. Being on anchor is so relaxing and quiet. Cool at night, in the upper 50's, our diesel furnace kept us toasty and comfortable. Our luck continued and the seas were smiling on us. Anchor up at 7 AM. Planning on going to Moro Bay 65 Miles and 9 HOURS away. One of about 10 oil platforms in the Santa Barbara Channel and its northern approaches. Expect this is why there is such good cell service in Coho. As we approached one of the platforms we started seeing oil on the water and could even smell it. It lasted about an hour. Near Morro Bay we has a whale appear less than 100 feet from the boat. Close enough to see the barnacles on his side. He was traveling parallel and with us. He sounded and we did not see him again. It is a bit disturbing to go from isolated in your own world to realizing you are small and vulnerable in the blink of an eye. Weather continued to be pleasant and we decided to continue to Monterey Bay. This added about 12 hours to the trip and requires an overnight run. In calm seas we don't set a rigid watch schedule during daylight hours. At night we try and make sure each of us has a minimum of 3 hours off watch to sleep. 4 hours is better and we often sleep either in the watch berth located in the pilot house or the salon couch. Quick access to the pilot house helps us both sleep better. The night went without incident as WORKNOT made her way up the coast. We only saw one freighter, 9 miles further off shore than us, and no other pleasure boats or fishing boats. We arrived in Monterey Bay about an hour sooner than planned. Seas were very calm and we had a favorable current much of the way. We jogged in a circle for about an hour before entering the harbor at daylight. It is never good to enter a harbor in the dark if it can be avoided and this one has a very narrow opening and a sharp turn to port just after you enter. Concrete walls on both sides and a new paint job kept me busy. Will try and catch a picture of the entrance as we leave. After failing to fit into the assigned slip we got an end-tie deep inside the harbor. Nordhavn boats are "FAT" and carry their beam all the way to the waterline. This makes for lots of volume inside the boat but can complicate slip selection. Few 50' boats are 16' wide at the water line. This is something you don't often see, a lock to keep people from putting money INTO the washing machines. At the Monterey Municipal Harbor the washer and dryer are located outside. To keep the general public (homeless people) from using the machines you need a combination code from the office to remove the lock so you can access the coin slot. I can only imagine how that city council meeting went. Just across from our slip the Monterey Peninsula Yacht Club overlooks the harbor. They had a sailboat race that even I understood. No trip to Monterey is complete without a visit to the aquarium. We have visited numerous times and each trip is new experience. The variety is world class, perhaps the best aquarium in the world. My favorite is the kelp forest and the incredible collection of "Jellys". If you haven't visited this California treasure make plans to do it. You won't be disappointed. Next up; travel to one of our favorite anchorages, Half Moon Bay and then San Francisco Bay.